During the last 12 months, I have completed a nine-week multiple murder trial involving incidents from 1995 and 2005. After a partial verdict, a retrial was calendared. I then spent another three weeks involved in an attempted murder and separate carjacking trial followed shortly thereafter by a four-week murder trial involving a shooting that occurred in 2005. And finally, I have just completed the five-week retrial of and am awaiting verdict. In my spare time, I am also serving as lead counsel for one of multiple defendants charged in the largest capital criminal prosecution in San Diego County history. I have also been actively working with attorneys in Los Angeles and Northern California in the formation of Ameriant Law Group LLP. This new statewide firm has been established to focus upon the many different types of legal services required by the medical cannabis industry and its patients. While attending law school at CWSL, I was employed as a clerk with the San Diego County Public Defender’s Office from 1992-93. After admission to the Bar in early 1994, I worked as a deputy public defender until 2003. In 2003, I opened the Law Offices of Stephen G. Cline and handled primarily complex criminal and civil rights litigation. In 2004, national attorney rating service Martindale-Hubbell honored me with its highest peer rating (“pre-eminent legal ability”). In 2010, I began formation of Ameriant Law Group LLP in order to address the substantial void of legal services available to business owners and patients within the medical cannabis industry. I am member of both the California Public Defender’s Association and San Diego County Bar Association. I have worked with the SDCBA Private Conflicts Counsel Program and now San Diego County Office of Assigned Counsel since 2002. I have also been very active with SDCBA sports programs. I have served as the commissioner of the SDCBA Coed Softball League for several years while my office has also regularly sponsored teams in both that league as well as the Men’s A/B Softball League. I have been actively involved with the clinical internship program at California Western School of law since 2003. My office has served as a clinical training ground for roughly five full time interns per calendar year. I have also extended this program within my office to post graduation mentoring which includes clerk and contract work while also assisting with formal job placement once they pass California Bar examination. As of 2011, my office has also begun a similar intern/mentoring program with paralegal students at University of San Diego. Although I have worked very hard to reach this point in my career, it would not have been possible without the guidance and friendship of myriad persons both in and out of the legal community. Although I have recently lost him, my grandfather Paul Lunardi has long served as that role model I always sought to emulate through the ups and downs that are common to life. 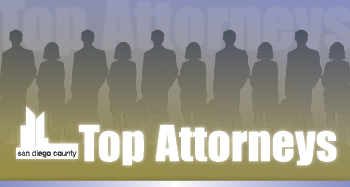 I have been blessed with guidance and mentoring from amazing attorneys in my career such as Richard Gates, Juliana Humphries, William Trainor, Gary Gibson, Gary Nichols, and Michael Roake who, each in their own way, have contributed to the attorney I have become today. And most importantly, I am lucky to have an amazing support staff in my office. While all have been essential to getting through the last year, my office manager Trisha Phillips and lead associate Jason Najarian have risen above the call of duty on an almost daily basis.